When it comes to curated subscription experiences, Birchbox is the biggest player in the game- and with good reason. Founded in 2010, the brand can be credited with setting off the boom in popularity of subscriptions. That trend has only gained steam in the eCommerce world in the eight years since their founding. In order to remain on top amongst a field of competitors, Birchbox knows that they need to continue to evolve and provide experiences that delight consumers. The site design will change based on which subscription box has debuted that month. The look will take elements from each box design, such as the color scheme and patterns, and incorporate them into the header image, font color and rollover colors for links. 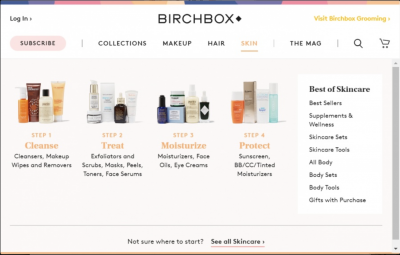 The experience gives shoppers an easier entry point into the Birchbox subscription service and creates a sense of newness every month, according to Meredith Schwartz, VP of Product at Birchbox. Customers will also find a more simplified menu of products, reducing hesitation and friction as buyers move through the experience. Check out the full article here!